I concluded last year’s edition of My Must-Have Mac Apps suggesting that, with iCloud approaching its public debut and developers starting to integrate native sync in their iOS and OS X apps, “a new class of Mac software” would take us in new directions. While that has been (partially) the case, 409 days later the results are more nuanced. For developers, iCloud integration didn’t quite go as planned. Launched to much acclaim with iOS 5 in October 2011, iCloud immediately appeared as a fantastic solution to keep personal data in sync between iOS devices, but a more complex technology for third-party integration. For one, iCloud wasn’t even natively enabled on OS X at first: Apple had to ship a software update to Lion – 10.7 was released in July 2011 – to bring official iCloud support to the desktop. Months later, developers were still deeply concerned with the state of iCloud sync for third-party apps, as the APIs Apple provided turned out to be difficult to implement and unreliable at best. With Mountain Lion, iOS 6, and WWDC ’12, Apple tried to improve the overall experience for both users and developers. At the developer conference, Apple announced and demoed changes to iCloud that, according to developers I’ve spoken with, have improved the service, but not dramatically so. Mountain Lion has been received (here’s my review) as a fantastic upgrade for Lion users, and developers seem to be equally satisfied with the changes brought to OS X 10.8. iOS 6, on the other hand, has been welcomed by developers but criticized by some users for changes like Maps and the new App Store. That hasn’t stopped, though, iOS 6 from becoming a widely adopted update among consumers. When it comes to third-party Mac software – the essence of this annual series; the first installment was published in September 2010 – it’s important to consider the effect the Mac App Store had on the developer ecosystem. And even in that case, the truth isn’t black or white, but a very peculiar shade of “it depends”. There’s no doubt that the Mac App Store has helped developers reach a much larger audience than ever before. Especially with featured sections, promotions, and the revamped Editor’s Choice initiative, developers have been able to catch the attention of more users. That, however, has come at a cost. Due to a variety of “rules” that Apple has been enforcing or creating from scratch in the past year, developers have found themselves struggling with review times, rejections, and, more importantly, having to deal with “simplifying” versions of their apps for the Mac App Store. But even in that case, there’s more to the story than just “Dumbed Down Apps” headlines. Developers of existing apps had to cope with removing features to be accepted or stay on the Mac App Store. 1Password had to remove the possibility to pick any folder for its database, and Bare Bones Software had to ship a Mac App Store version of BBEdit without command line tools and “authenticated save”, two features that are still available on the standalone version of the app sold on their website; TextExpander 4 couldn’t be released on the Mac App Store at all. These changes relate to Sandboxing, a technology aimed at making Mac software work within a controlled environment. After several delays and much criticism, Apple started enforcing Sandboxing earlier this year; we’ve been following the topic on MacStories. Ted Landau published a good roundup of the casualties of Sandboxing after a month, and Red Sweater Software’s Daniel Jalkut offered some great suggestions to Apple in February. On the flip side, developers were somewhat forced to embrace the Mac App Store if they wanted to offer support for the latest features offered by Apple on Mountain Lion. Namely, Notification Center and iCloud, which users have come to expect from third-party software that has sync and notifications. Providing support for the latest features of OS X has become essential to end up in sections regularly updated by Apple such as Enhanced for Mountain Lion. A year after iOS 5’s debut, we have several great apps that sync with iCloud, but developers are still concerned with the current state of the service. Many haven’t jumped on board yet. A common thread I’ve observed in the past months is that of Mac apps using Mountain Lion’s native iCloud Document Library to sync with their iOS counterparts: apps like Byword, iA Writer, and MindNode are good examples. On the other hand, a much more exicting trend is that of apps that don’t provide a Document Library to visually represent iCloud’s file storage. Apps like Tweetbot, Due, Screens, and Day One sync with iCloud automatically and in the background, without relying on a “file manager” to communicate the manual act of saving “documents”. iCloud is one of the biggest changes to happen to OS X development in years, and surely one of the most challenging for developers. iCloud has a long way to go: Dropbox is still the preferred solution for file-based sync in several apps, and many long-time Mac developers have decided to continue investing in their own sync engines rather than adopting iCloud. In collecting the apps for this year’s roundup, I decided to lay down some ground rules so that the series will be better organized in the future. First, gone is the self-imposed limit of 25 apps: I will link to every app that I consider a “must-have” in my workflow. Second, to be named a “must-have”, an app must be used regularly on a daily or weekly basis. And last, apps from either the Mac App Store or a developer’s website can be mentioned in the roundup. In the past year, I’ve added some apps to my daily routine and workflow. Notably, four of them are menubar apps and three of them are related to plain text and my writing workflow. There are some apps I don’t use anymore, and this year they’re five. Two of them, Chrome and Sparrow, are directly related to Mountain Lion. Last year, I mentioned how I was using Chrome because of its better process management, extensions, and sync across devices. With Mountain Lion and Safari 6, Apple has drastically enhanced the performance of the browser – now Chrome is starting to be the bloated one – while bringing native iCloud sync for tabs. iCloud Tabs has been a terrific addition that I now use every day in combination with my iOS devices. I’ve also cut back on extensions, and now the only ones I use are 1Password and NoMoreiTunes. For email, after Google announced they had acquired Sparrow I had a feeling the app would begin showing its age with a lack of updates and unreliability. This has indeed been the case in the past few months. Fortunately, switching to Mail.app had its advantages: I enjoy the convenience of VIPs synced with iCloud and the consistency of Mail’s interface across platforms. I removed Little Snitch earlier this year when I upgraded to Mountain Lion, and I still haven’t had time to properly try the new version 3.0. I’ve used iPhone Screentaker for years, but now I prefer embedding iOS screenshots on MacStories without device frames, using Keyboard Maestro if they’re iPhone screenshots. iPhone Screentaker is still a great app. Last month, I officially said goodbye to Tweetie. But long before that, I had hit the Delete key on Twitter for Mac, the best OS X Twitter client that never was. Rumor has it Twitter has pulled the plug on the desktop client, which hasn’t seen an update in over a year. Luckily, there’s another bird in my Dock now. I don’t like change for change’s sake. 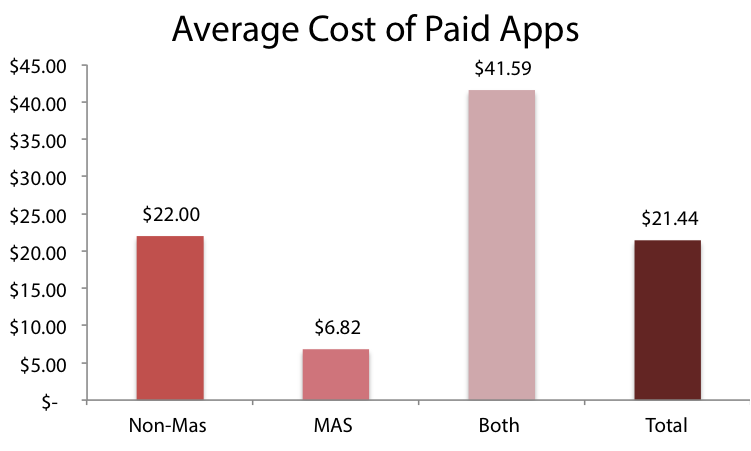 New apps don’t become “must-haves” just because they’re new. And that’s why some key parts of my workflow have remain unchanged for almost two years now. Clipmenu: A minimal yet powerful clipboard manager for OS X that I’ve been using for three years now. You can assign hotkeys to your clipboard history or groups of oft-used text snippets. Other apps like Alfred and Keyboard Maestro offer clipboard support, but I like the simplicity and native aspect of Clipmenu better. I love it. iStat Menus: Bjango’s app is my favorite way to keep an eye on my Mac’s CPU, RAM, and Network usage, as well as different time zones. Evernote: I use Evernote to store reference material (PDF, screenshots), sketches made in Paper and Penultimate, and images annotated with Skitch. Their Mac app is getting a serious overhaul with version 5.0, which I’m playing with these days. Once I realized Evernote wasn’t aimed at plain text nerds like me, I fully embraced its potential of a platform that can “remember everything”, everywhere. The Unarchiver: My unarchiving utility of choice. It supports .RAR archives, plus a lot other formats. Fast, and free. Alfred: It started as an application launcher/Spotlight alternative, and quickly became so much more. Alfred is a Mac app that we’ve been following since the first release here at MacStories. Alfred gained a whole new dimension with the latest update, which adds a “File Buffer” feature that I use to quickly get to folders I use often and run actions for multiple files at once. 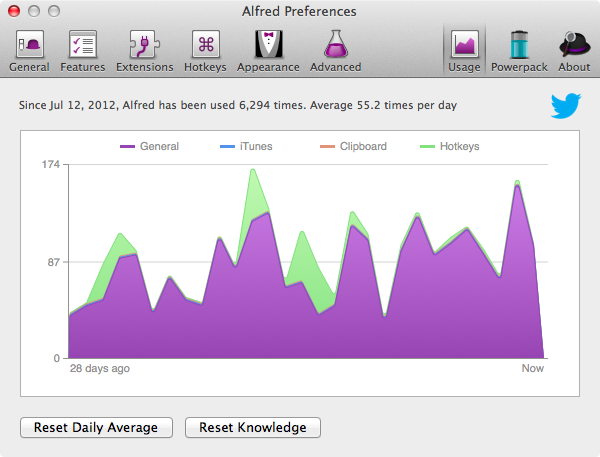 Check out the image below to get an idea of how much I use Alfred (and I don’t use it that much). 1Password: My password manager since 2008. If you’re not using 1Password to generate and store secure passwords, you’re most likely doing it wrong. Dropbox: Sounds obvious, but I use the Dropbox app quite a bit, background syncing aside. I especially rely on the “Copy Public Link” item of the Finder’s contextual menu and Selective Sync, which allows me to keep certain Dropbox files/folders from being downloaded on my computer. I liked the new interface Dropbox designed for the OS X beta client, but the company decided not to ship it. OmniFocus: My task manager of choice. To get a better overview of how I’ve used and enhanced OmniFocus over the past year, check out the OmniFocus tag on MacStories. Transmit: Panic’s app didn’t receive any major new features, but it’s still the best FTP client for the Mac. One thing not so many people know about is the Transmit Disk functionality, which gives you a menubar shortcut to mount remote locations in the Finder. It’s very handy. Reeder: Still my RSS client of choice. It hasn’t changed much, but it now supports some new services for sharing links. Still, one of my favorite features remains the simple S shortcut to mark a post as starred. Day One: I like to think that, twenty years from now, I’ll look back at the personal notes and memories stored in Day One and remember moments and episodes of my life I had put away and forgotten. More than a productivity tool, Day One is a personal experience. You can read more in my review of the iOS app, which works exactly like the Mac client. Or, if you want to enhance Day One, check out Brett Terpstra’s Slogger. Hazel: If I had to pick only five apps to install on my Mac, Hazel would be one of them. I started using it last year for some lightweight automation on my MacBook Air. A few months later, when I got a mini on Macminicolo, I discovered the full potential of Hazel as a background utility that runs actions for you. Our Hazel tag on MacStories is a good way to get an idea of what this app is capable of. Keyboard Maestro: Same story as Hazel. I started using Keyboard Maestro in 2011, and once I read more about AppleScript, Python, and OS X automation in general, I really got hooked to its features. I use Keyboard Maestro on a daily basis to expand text snippets, combine screenshots, write in Markdown, share links with my team, and more. I’m pretty sure I wouldn’t be able to use my Mac anymore without Keyboard Maestro installed. Rdio: I switched to Rdio last year, and I’ve been using the service every day. I don’t like the latest changes to the Mac app and web UI (not to mention the outdated nature of the iOS client), but the overall flow of Rdio, unlike Spotify, works for me. Take Five: Still the best way to quickly pause and resume music from Rdio. There are two apps I’m still not sure I want to remove from my daily setup. As you may have noticed, I’ve been sharing my own image URLs on Twitter lately (powered by Tweetbot’s custom uploads), which have lessened the need for a quick sharing solution like CloudApp. However, I don’t know if I’m going to stop using it completely, as I hear updates to the app are coming and friends like Gabe have gotten me curious to check out its API again. The other app that falls under the Maybe list is Airfoil, but mainly because I still have to find an external speaker that both my girlfriend and I like. I’ve been listening to music with Apple’s Earpods lately, as I find them surprisingly comfortable when I’m at my desk. But, in the end, I think I won’t stop using Airfoil: I see a new speaker on the horizon (read: holiday shopping season). There are also two other apps that I’ve added to my workflow very recently; I think it’s appropriate to mention them in a separate “Newest” category. I use Instapaper to catch up on articles I “saved for later”, but Pocket for Mac is a great way to sit back, grab a good cup of coffee (espresso), and enjoy some video. I like the app’s support for full-screen mode and selection of keyboard shortcuts. Status Magic was only released last week, but it’s such a great tool for bloggers who deal with iOS screenshots on a daily basis I can’t help but including it in this year’s list. Check out my review here. These are the new apps that I’ve added to my workflow in the past 14 months. Palua: A simple utility that triggers the behavior of F1/F12 keys on Apple keyboards. With a single hotkey, you can switch from Apple Mode to Function Mode – useful for those apps that use F keys in their menus, such as Sublime Text. The latest update, which I’ve covered here, features a “Smart Mode” that always triggers certain behaviors for specific apps. Bartender: One this year’s best new releases for the Mac. Bartender is a menubar app to contain other menubar apps. Say you’ve got too many menubar apps running at the same time, and you would like to have less, but it’s always handy to keep them around and running. Bartender is perfect for that kind of scenario. It is a “More…” menu for your Mac’s menubar, enabling you to put apps you don’t use very often in an optional “Bartender menubar”. Bartender has lots of options, supports Mountain Lion, and even system icons like Spotlight and Notification Center. Fantastical: Another app I’ve been following (and using) since its very first version. I like Fantastical for two reasons: it lets me add new calendar events quickly using natural language, and it provides me with a clean, streamlined overview of my upcoming events. 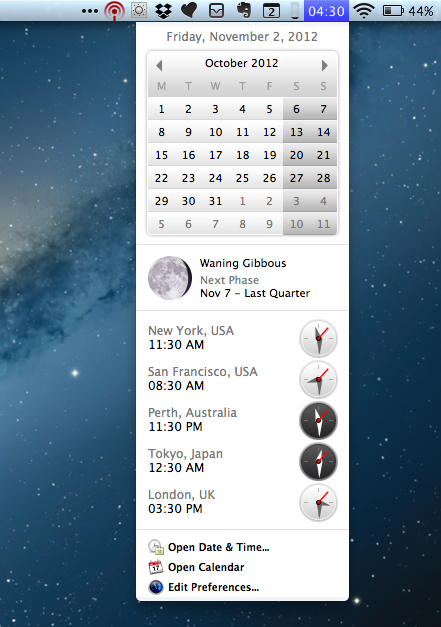 That’s all I need from a calendar app, and yet Fantastical does so much more. Ridiculously awesome. 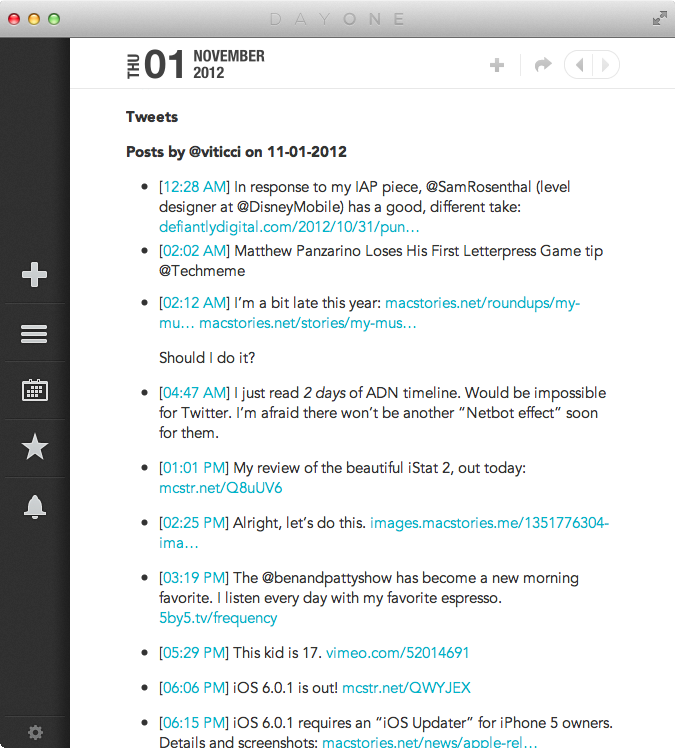 Tweetbot: The best Twitter client for Mac. Everything I needed to say about Tweetbot I’ve already said in my two separate articles. Sublime Text 2: I’ve started using Sublime recently after hearing about it for over a year, and now that I’ve taken the time to learn its basics, I can see why others were obsessed with it. As a Markdown writer, I’ve collected some of the best Sublime features here. But if I had to pick only one, I would say: multiple cursors. Trust me on this one. Reflection: Here’s the thing about Reflection – it’s perfect to create animated GIFs of iOS apps. I’ve got Matthew Panzarino to thank for this tip: using an app like Reflection, you can mirror your iOS device’s screen to a Mac, and run QuickTime to record the portion of the screen displaying an iPhone or iPad streaming in real time. Then, using GIFBrewery, you can further refine your frame and create a GIF off your newly recorded QuickTime video. I use Reflection whenever I need to create GIFs or HTML5 videos. I personally recommend AirServer if you plan on mirroring multiple iOS devices simultaneously through AirPlay, but for single-user sessions, I prefer Reflection. Marked: I write articles in Markdown, and eventually that plain text has to become valid HTML for this website. But at the same time, when I’m in the middle of a writing session I like to check out how a post will look like. To do this, I use Brett Terpstra’s excellent Marked. We’ve covered the app a few times in the past. In short, it’s a Markdown previewer with support for themes, keyboard shortcuts, scripting, and various exporting options. With the Marked Bonus Pack for Sublime Text, I can hit a single hotkey and have my Markdown document instantly previewed in a window; then, it’s CMD+Shift+C to copy the HTML code and post on MacStories. nvALT: I don’t know what Brett Terpstra’s secret is, but one day I’m going to find out, steal it, and change my name to Brett Viticci. Until then, I’ll just keep using nvALT because it is a fantastic fork of Notational Velocity with better Markdown features, better shortcuts, and, more recently, support for inter-app note linking. ImageOptim: My teammates have been using ImageOptim for years now, but for some reason I had always ignored the app. Earlier this year, when Cody linked to a post detailing the benefits of running ImageOptim – an image optimizer – without losing the quality of images at all, I decided it was time to try it. I’m glad I did. Basically, ImageOptim works like magic, cutting down the size of images without making them look worse. It’s incredibly fast on JPEGs, a little slower on higher-quality PNGs. Recommended. 5by5 Radio: Developed by David Smith and then acquired by 5by5, this is the official app to listen to Dan Benjamin’s network. More than a simple streaming client, 5by5 Radio supports Notification Center alerts for shows that are about to begin (with an option to auto-play a live stream), has filters for shows that you’re interested in, and an embedded schedule. A trusted morning companion to be alerted when The Frequency and Amplified are starting. iCloud may be the platform for the next decade, but one thing that strikes me as consitent across the apps I use is that many of them aren’t exclusive to the Mac App Store or use iCloud at all. 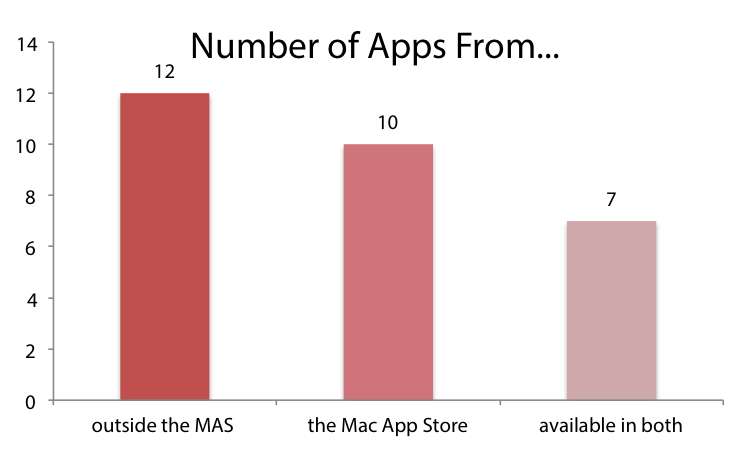 Of 29 apps, 12 aren’t available on the Mac App Store. 10 of them are Mac App Store-only. 7 of them are available both on the Mac App Store and the developer’s website. Looking at the data, I concluded that my setup isn’t a reflection of the average Mac user, as I explained above. 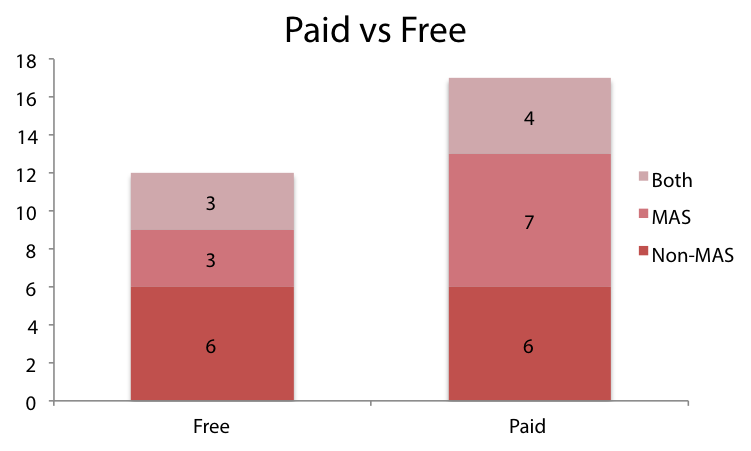 Still, I think it represents a segment worth considering: there must be other users like me out there. Apps sold outside of the Mac App Store are generally more expensive in my list because I have purchased software that is sold at a premium price; in the “Both” category, I have purchased the versions available on the developer’s website, but it’s good to see developers like The Omni Group, Panic, and Flexibits have managed to port their apps with unchanged prices to the Mac App Store. For software not available on the Mac App Store, I’d like to note how the average cost of the four utilities I use every day (Hazel, Keyboard Maestro, Bartender, iStat Menus) is $23. My conclusion is that a) I tend to purchase apps from developers I trust through their websites and b) I’m the kind of user that likes to pay for fine pieces of software that will enhance my workflow. Looking ahead, I think we’ll keep seeing more apps adopting iCloud and other developers settling on their proprietary syncing solutions. Developers of apps that can’t be sold on the Mac App Store will be fine thanks to Mountain Lion’s Gatekeeper, but I also believe Apple will eventually come around and allow more “complex” software to be sold on the App Store. We’ll see. In 2013, I expect my setup to be even more divided between Mac-exclusive software that automates and speeds up my workflow, and apps that work in conjunction with iOS versions. As usual, let’s check back in a year.